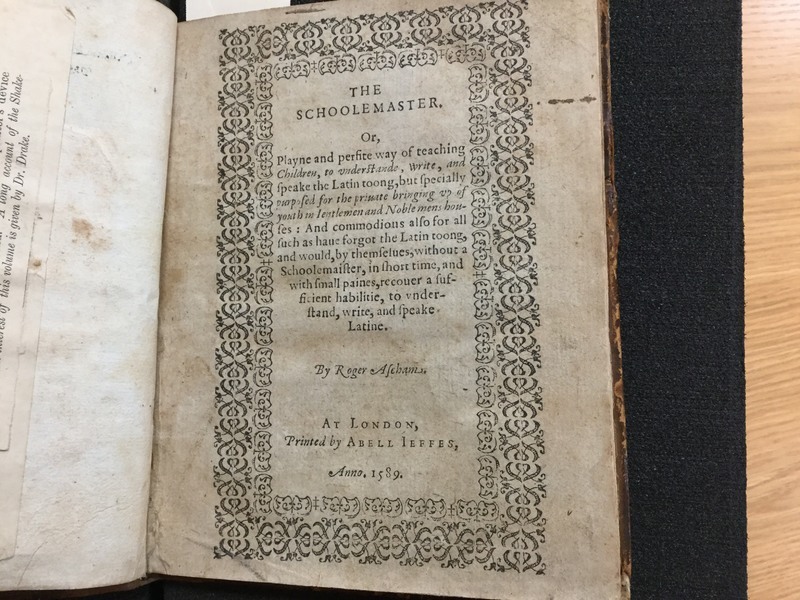 The Schoolemaster by Roger Ascham is a textbook for teachers specifically for the private teaching of youth in Noblemen and Gentlemen's homes. 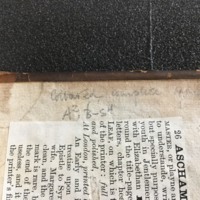 Ascham in his early teens was sent to live with Humphrey Wingfield, who was known to be very good at bringing up youth. So it’s not surprising that Ascham wrote a book that included teaching manners to young people later in life. 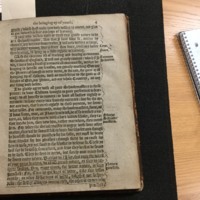 The Schoolemaster was printed with Elizabethan Black Letter. 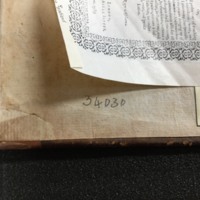 It also includes a woodcut border on the title page and several woodcut drop capitals/chapter headings. 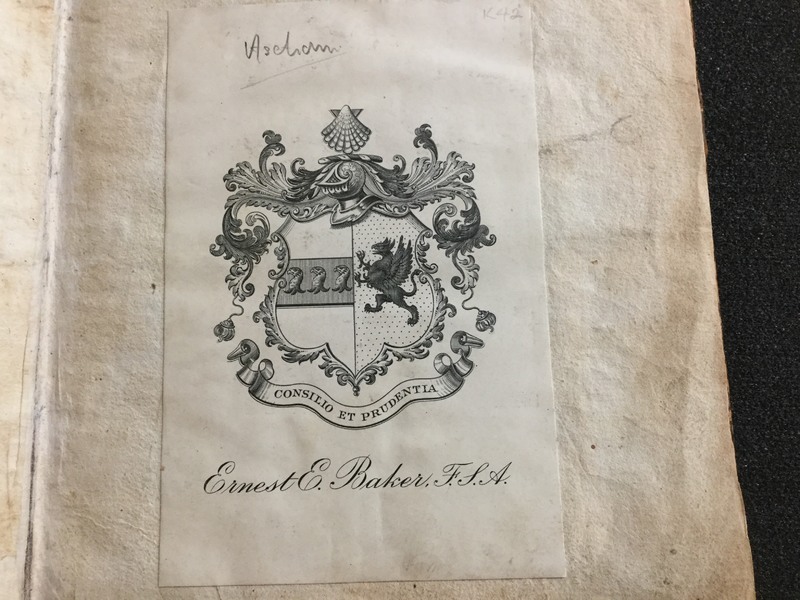 Another interesting addition is the Printer's Trade Mark which can be quite rare. 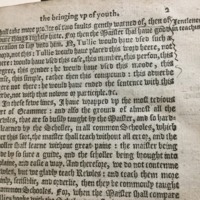 This is an interesting edition that would engage anyone interested in the art of teaching. 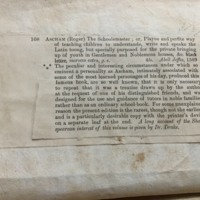 Page from a book catalog about The Schoolemaster located on the inside of the back cover of the book. 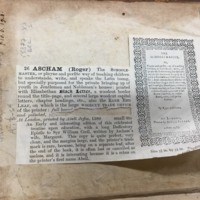 Page from book catalog located on the back of the front fly leaf. 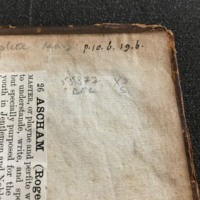 Librarian's marks can be seen on the front and back covers/flyleafs. 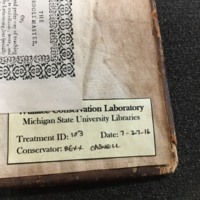 Michigan State University Libraries book plate located in the inside of the back cover. 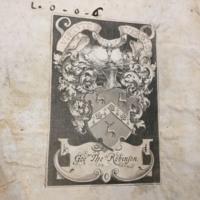 Book plate of John Lawson located on the back of the front cover. 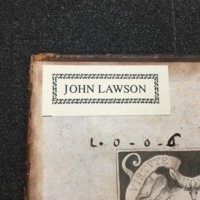 The only John Lawson I could find of any note was alive in 1674-1711 and this book plate looks far too new to have been from him. 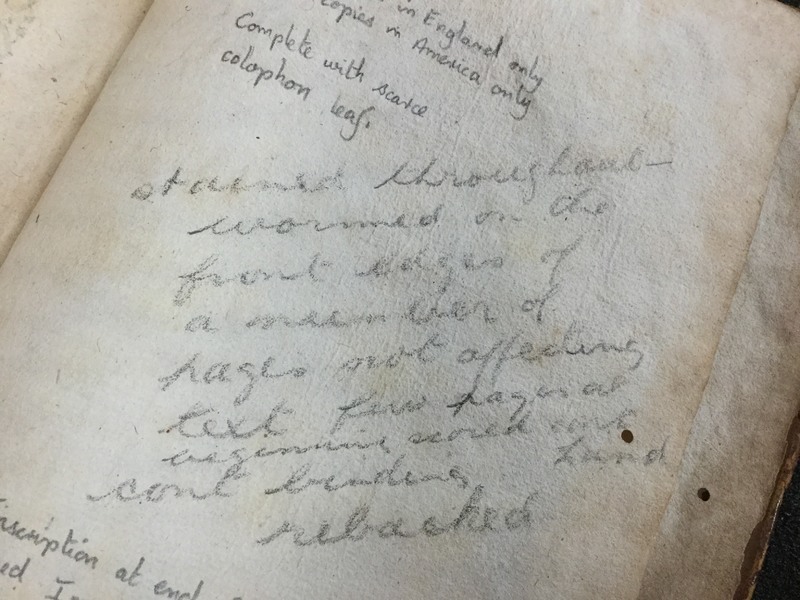 Pencil Writings on the front of the back fly leaf that seem to be in the same handwritting. 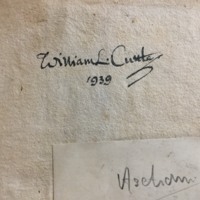 They describe certain features of the book such as "Inscription at end of preface signed" and "Three copies in England only". 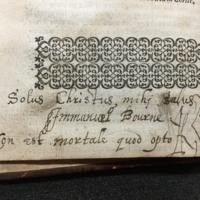 The fact that the writing is written in today's English, that it's very visible, and that it's not written in cursive leads me to believe that this was written very recently within the last couple of decades. 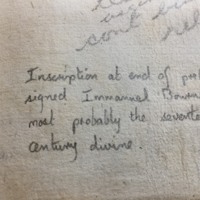 While that's not as cool as some of the other pieces of provenance it's still interesting to see what others thought was important about the book. 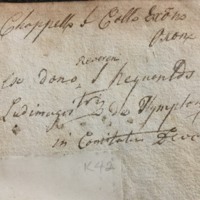 Message/Signature by Chappello L. Callo. I am unsure of who this is and what he has written, but it is very cool. 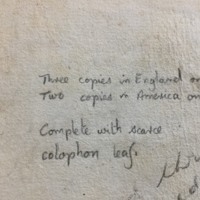 Very faint penciled notes on the front of the back fly leaf. I found it very difficult to read except for a few words. 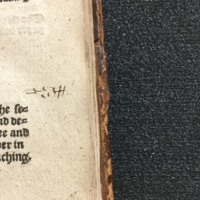 Underlining can be seen on pages 2,3,4,5, and 17. 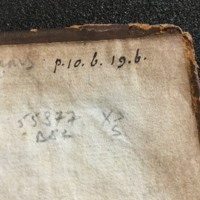 Scribble located on the back of page 17. It looks a bit like an E and a 3. 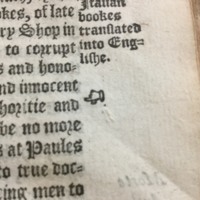 Doodle of a hand pointing to a line of text located on the front of both page 25 and 26. 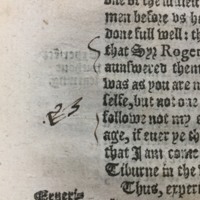 Scribble located on the front of page 3. I have no idea what this is or what it means. 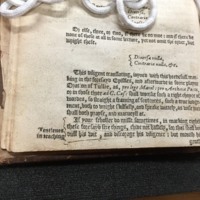 This information on The Schoolemaster was brought to you by Jordan Warren a student of Michigan State University and member of Professor Liam Brockey's History of the Book class.